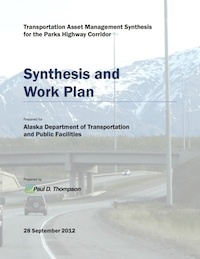 The Alaska DOT&PF – Transportation Asset Management Synthesis for the Parks Highway Corridor is available here. Alaska DOT & PF seeks to develop their agency's asset management maturity in order to improve the life cycle management and performance of their resources. The TAMP addresses a desire to more effectively use rich collections of data, fill gaps in data and understanding of performance, and change organizational procedures and culture. This TAMP outlines a work plan for the timeframe of 2012-2014, composed of self-contained projects for the advancement of the agency's current practice. This document includes the following sections: Data Management, Introduction, Levels of Service, Objectives and Measures, Performance Assessment, Regulatory and Legislative Requirements.